Phosphopeptide Enrichment Flow-Thru Plates are the ideal equipment for vacuum/centrifuge powered capture of phospholipids from plasma, serum, and whole blood. The plates utilize phospholipids’ selective affinity for Glygen’s unique TiO2+ZrO2 mixed media. 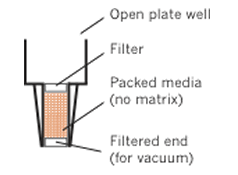 The Flow-Thru Plate’s unique design allows sample to flow from the top of the well, through the media bed, and out the well bottom. Plates contain TiO2+ZrO2 mixed media optimized for broad-spectrum phospholipid capture. Click the button below to add the Phospholipid Removal Lab-in-a-Plate Flow-Thru Plate to your wish list.